Enjoy the top 1 famous quotes, sayings and quotations by Angie Klink. “December 29, 1946: Snowing this morning. The year seems to be dying in a light white blanket. Only three more days of this year, then comes a new one. Then, what? No one knows. December 29, 1946: Snowing this morning. The year seems to be dying in a light white blanket. Only three more days of this year, then comes a new one. Then, what? No one knows. 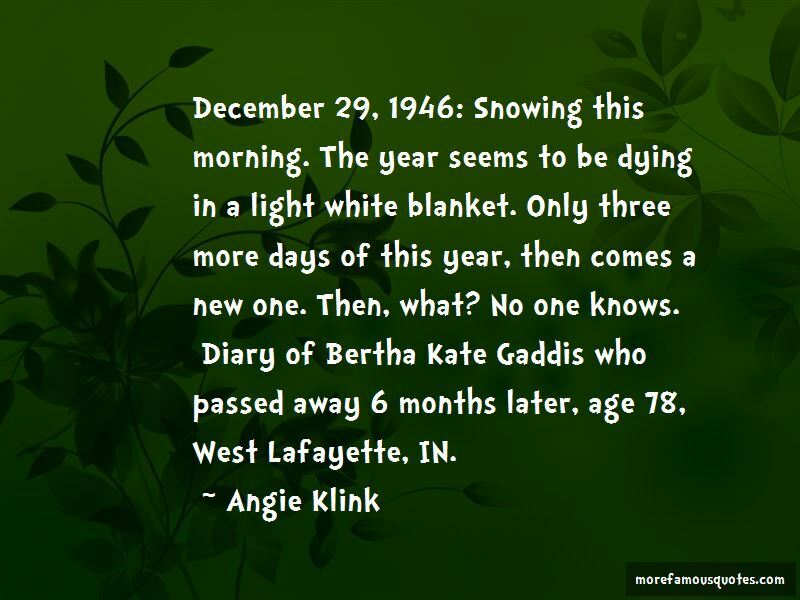 Diary of Bertha Kate Gaddis who passed away 6 months later, age 78, West Lafayette, IN. Want to see more pictures of Angie Klink quotes? Click on image of Angie Klink quotes to view full size.